LARENCORE: U.S : He was shot right in front of his kids ! Angel D'Angelo started a petition to demand State Attorney Bernie McCabe file homicide charges against Michael Drejka for the murder of Markeis McGlockton ! A young Black father was killed by a white man in Florida -- and he's being protected by the awful "Stand Your Ground" law. Tell FL State's Attorney Bernie McCabe : file homicide charges against Markeis' killer ! A devoted father is dead. On July 19th, 28-year-old Markeis McGlockton was shot in the chest and killed by white man, Michael Drejka. 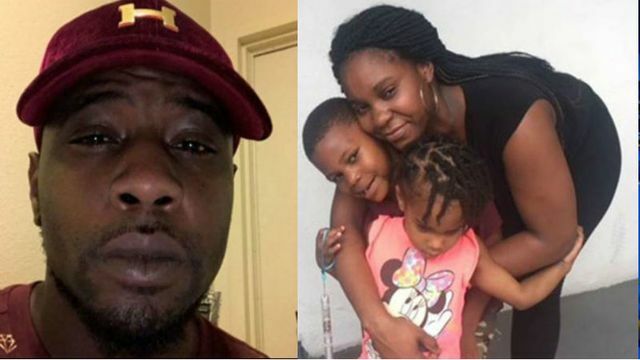 He was with his young children and girlfriend outside of Circle A convenience store in Clearwater, Florida and the gunman harrassed and bullied Markeis’ girlfriend, Brittany Jacobs, over a parking spot. There is heartbreaking video surveillance footage that shows Markeis coming out of the store to defend and protect his girlfriend and children. He shoves Michael Drejka away, but the gunman falls to the ground, pulls out his gun and shoots Markeis point blank in the chest. Markeis runs back into the store, pleads for help before collapsing in front of his 5-year-old son. Markeis later died at the hospital. Michael Drejka stole his life away, but he hasn’t even been charged with a crime and is walking as a free man. Justice for Markeis: Tell State Attorney Bernie McCabe to charge Michael Drejka now. The day after the shooting, Pinellas County Sheriff Bob Gualtieri announced that no arrest will be made against Michael Drejka. To make matters worse, Sheriff Gualtieri blamed Markeis for his own death. The sheriff said : “Markeis should not have gone up and slammed this guy to the ground...And the reason why it makes it justified, and within the framework of 'stand your ground,' is because of what Markeis did." Florida’s horrible “Stand your ground law” which passed in 2005, which makes it legal to kill someone if they feel their life is threatened has reared its ugly head against another Black person like we’ve seen with the murder of Trayvon Martin. Now, together, we must put the spotlight on Pinellas and Pasco Counties State’s Attorney Bernie McCabe to do his job and file homicide charges against Michael Drejka -- this will be a crucial first step in delegitimizing the law. State Attorney Bernie McCabe: Stand Your Ground Law is a license to kill Black people. Michael Drejka shouldn’t get away with murder. The killing of Markeis McGlockton is another brutal reminder that Florida’s “Stand your ground” law is harmful and deadly to Black people. We live with the painful stain of February 26, 2012, when then 17-year-old Trayvon Martin was gunned down by an overzealous, racist neighborhood watchdog George Zimmerman in Sanford, Florida. Zimmerman wasn’t arrested until two weeks after he killed Trayvon. Day after day Trayvon’s family beared the strength to sit in the courtroom with Trayvon’s killer only to face the horror of Zimmerman’s acquittal because he was able to use Florida’s “Stand Your Ground” law as a defense for killing a young boy who was just walking home--posing absolutely no threat to Zimmerman. “Stand Your Ground” conveniently doesn’t apply to Black people who use self-defense. In 2010 in Jacksonville, Florida, Marissa Alexander, a young Black mother and a survivor of domestic violence, while escaping her abuser she fired a warning shot with a gun and did not injure anyone. Yet, former Jacksonville State’s Attorney Angela Corey was aggressive in pursuing criminal charges against Marissa. This initially led to Marissa being convicted to a mandatory minimum of 20 years in prison. This law does not protect anyone. Black people are being murdered and unfairly blamed for crimes committed against them. Families, friends, and young children are losing their loved ones. “Stand your ground” further perpetuates a racist notion that Black people are to be feared and are deemed threatening. It remains a part of this country’s consciousness that killing or locking up a Black person is standard. Tell Florida State’s Attorney Bernie McCabe to file charges against Markeis’ killer. Collectively, Markeis’ family, our communities here in Florida and all across the country are mourning, and furious about the murder of Markeis McGlockton. What happened to Trayvon, Marissa Alexander, and countless other Black people have sparked one of the greatest social movements of our time. Black Lives Matter has become a rallying cry to fight back against the unjust legal system that normalizes the killing and complete demonizing of Black lives. Now we must keep up the pressure on the state attorney and continue to ring the alarm on every elected official until the “Stand Your Ground law is no longer in existence. Markeis should be with his family, playing and laughing with his children. State’s Attorney Bernie McCabe cannot ignore this senseless killing. We will march in the streets, make calls, spread the word on social media and demand justice until we win and all Black people can live freely and safely. Please join us in signing this petition to demand justice for Markeis. He should be alive today!